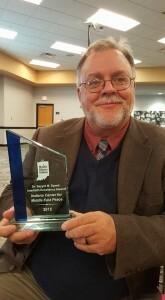 The Indiana Center for Middle East Peace has recently been recognized for its work in the community and around the state. ICMEP's executive director, Dr. Michael Spath, was recently awarded the Peace and Justice Commission of Allen County's Peacemaker Award. The Commission stated the award was given “In recognition for his inspiring pursuit of peaceful educational efforts locally, nationally, and globally; For his continued efforts to bring together people of various faiths working together to make our city a genuine community of faith; Specifically, for his leadership of the Indiana Center for Middle East Peace and its programs that have introduced us to outstanding leaders and witnesses of the continuing Israeli-Palestinian conflict who are committed to a peaceful resolution of their persistent, painful differences." Second, ICMEP was recognized in Indianapolis by the Muslim Alliance of Indiana with its Interfaith Excellence Award for its ongoing efforts in furthering interfaith and intercultural understanding in their pursuit of peace and human rights.